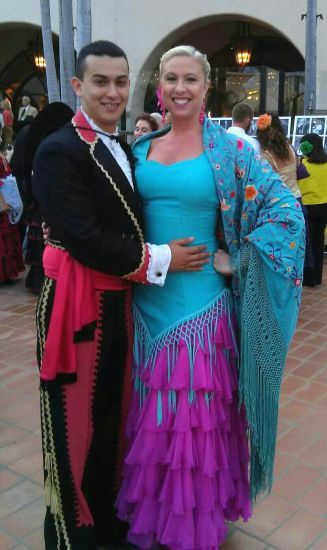 Spanish Baroque Intensive Scholarships Announced for 2016 | The New York Baroque Dance Co.
Outside of being a full time student at Santa Barbara City College, Alexis works at Hillside House and volunteers her time at both the Cottage Hospital and the Public Health Department. Dance is a part of her culture and as a native of Santa Barbara she wishes to share her love of dance through her performances with the Spirit of Fiesta. The Spanish Baroque Intensive will deepen her understanding of where the dances of fiesta originate. She hopes one day to serve in the health field and to give back to the community. We are including a link to an essay about this project which sheds light on the early local history of some of the dances we will be studying with Ana Yepes in our intensive. We are happy Thea will be joining us and she has expressed an interest in sharing with other teachers her approach to bringing dance history into public education. Thea is pictured here with her husband, Boris Palencia. began her dance training in Santa Barbara, California in the styles of Classical Spanish dance, Flamenco, Baroque, Ballet and Mexican Folklorico. After graduating from UCLA with a B.A. in World Arts in Cultures, Marisol lived in Madrid, Spain for three years receiving her credentials in Danza Española and Flamenco. She has performed in London, Mexico, South Korea, Spain, and Hong Kong. Since moving to New York City, Marisol has received her M.A. from NYU in Arts Education from the Gallatin School of Individualized Study. She is a guest choreographer and performing artist with Company XIV, Siren Baroque and the Juilliard Dance Department. Marisol is currently on faculty at The Ballet Hispanico School of Dance teaching Spanish and Flamenco to young dancers. She is thrilled to be back in Santa Barbara performing and participating in this year’s Historical Dance workshop.